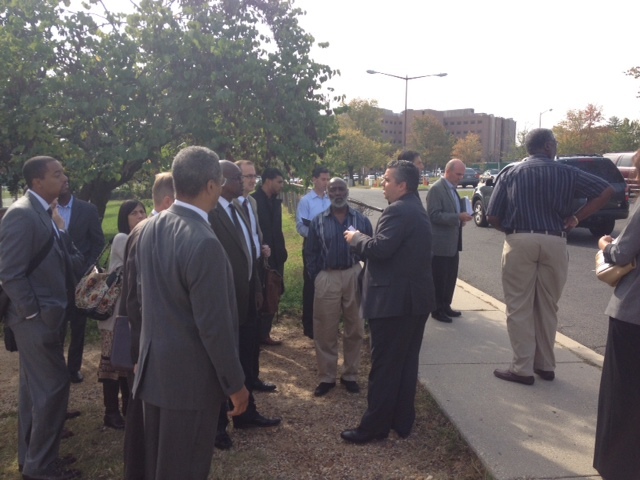 Attendees at the Oct. 17 DMPED RFEI Pre-Response Conference get a brief tour of parcels F1 & G1 at Reservation 13. Two weeks ago, the Deputy Mayor for Planning and Economic Development (DMPED) released a Request for Expressions of Interest (RFEI) for Phase I of the Hill East District Redevelopment at Reservation 13. Last Wednesday, I attended DMPED’s Pre-Response Conference on the RFEI at the Department of Corrections Training Academy on the Reservation 13 site. View DMPED’s conference PowerPoint presentation. As expected, the RFEI is limited to Parcels F1 and G1, the two parcels adjacent to the southern entrance of the Stadium-Armory Metro. The two parcels are currently used as parking lots. As expected, the RFEI does not include language giving the development team selected for phase I the right of first refusal to negotiate development rights for the remaining parcels on the site. Developers are clearly interested in the project. Around 60 or so individuals packed the room during the conference. A number of developers and development partners that bid on the original project in 2008 attended Wednesday’s conference. DMPED repeatedly emphasized that development should be consistent with the DC Council approved and neighborhood supported master plan. The plan calls for mixed-use retail and residential on F1 and G1. DMPED also highlighted that the RFEI calls for the creation of a “Village Square,” a vibrant mixed use area surrounding the Metro plaza. Retail would be clustered around this square. The development team selected will be responsible for extending Massachusetts Avenue, C Street, Burke Street and widening a small portion of 19th Street. The roadways will extend as far as the eastern border of F1 and G1. I’d like to see the city proceed with construction of the full Massachusetts Avenue SE extension during phase I. Not surprisingly, DMPED prefers responses that do not seek nor require the DC government to fund or subsidize any portion of the development. The city would like the winning development team to build the project without taxpayer dollars. Developers responding to the RFEI will have to submit two proposals. One proposal (Proposal A ) must comply with all of the affordable housing regulations applicable to the site, including the Anacostia Waterfront Corporation Reorganization Act of 2008 (AWI Act). The second proposal (Proposal B) can provide an alternative number of affordable housing units, a number that the bidding development team feels can be supported on the site without government subsidy. The AWI Act requires up to 30% of the total housing units be affordable, with 15% affordable to households earning up to 30% of the Area Median Income and 15% affordable to households earning up to 60% of the AMI. If a developer’s Proposal B is ultimately selected, it may require DMPED to ask the DC Council for a waiver from the AWI Act requirements. The RFEI submission deadline is January 7, 2013. DMPED will review all submissions and identify a short list of preferred development teams. Teams on the short list will present their plans to ANCs 6B and 7F in February, at which point DMPED may ask the short list to submit best and final offers. DMPED’s goal is to select the developer in spring 2013. Overall, I’m pleased to see the process finally moving forward. Please post your comments or questions below. This entry was posted on Monday, October 22nd, 2012 at 8:53 am and is filed under Development, Reservation 13/Hill East Waterfront. You can follow any responses to this entry through the RSS 2.0 feed. You can leave a response, or trackback from your own site. Did you happen ask any of the 60 or so people there what they might envision a developer building on this sight under the conditions set out in the RFP? Were any ideas even mentioned in passing? Thanks for the question Jim. At this stage of the process, I did not hear a lot of details from developers. The good news is the master plan and zoning for the site are pretty clear that F1 & G1 are for mixed use retail and residential and the community will have an opportunity to review proposals submitted. We are currently trying to bring DMPED out to the neighborhood to update residents on the process – they may be willing to share additional info on what they are hearing at such a meeting.